Plantar fascia rupture. – Pain. Health. Exercise. interpreting the research for you. Plantar fasciitis is pretty common but not plantar fascia ruptures. Have you seen one yet? Working with a podiatrist, I have seen 2 cases in the last 3 months. If you are as inexperienced as I was about plantar fascia rupture, read on. The plantar fascia is a thickened fibrous aponeurosis that originates from the medial tubercle of the calcaneus (pointy part of the bottom of your heel), runs forward to insert into the deep, short transverse ligaments of the metatarsal heads, dividing into 5 digital bands at the metatarsophalangeal joints and continuing forward to form the fibrous flexor sheathes on the plantar aspect of the toes. Small plantar nerves are invested in and around the plantar fascia, acting to register and mediate pain. The plantar fascia is made up of 3 distinct parts (above): the medial (MP), central (CP), and lateral (LP) bands. The central plantar fascia is the thickest and strongest section, and this segment is also the most likely to be involved with plantar fasciitis. In normal circumstances, the plantar fascia acts like a windlass mechanism to provide tension and support through the arch. It functions as a tension bridge in the foot, providing both static support and dynamic shock absorption. Right leg during stance phase. Our foot shape and arch changes when we bear weight on the foot. Our foot will begin to pronate when it first hits the ground (initial contact). 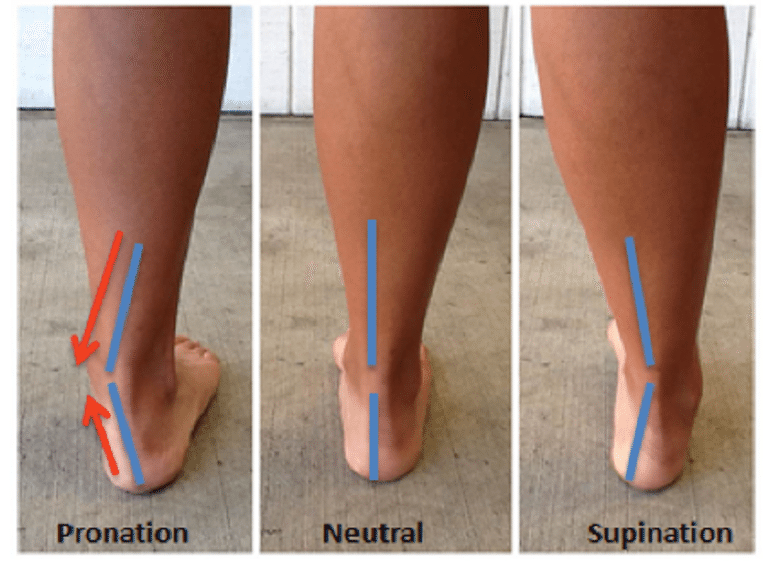 It transits to full pronation during mid-stance, then transiting back to supination to prepare for take-off. 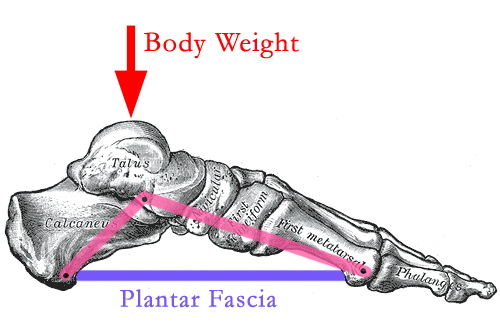 During this phase of walking, which we define it as the stance phase, the plantar fascia works like an elastic band. I like to describe the function of the plantar fascia as a ‘thick rubber band’ that stores energy between initial contact to mid-stance, and the stored energy changes to kinetic energy as during take-off. It makes walking and running less tedious by absorbing and dissipating load. our plantar fascia actually takes up quite alot of load every day. Can you imagine walking and running without a plantar fascia? What pathology normally happens at the plantar fascia? Plantar fasciopathy (or plantar fasciitis/fasciosis) is the most common disorder that can occur at the plantar fascia. This condition can happen to anybody: young and old, the fit and the inactive. You can read more about this condition in my previous posts here and here. The most common myth about plantar fasciitis is that the pain is due to the development of a heel spur. The point where the plantar fascia attaches to the heel, is called the calcaneal tuberosity. This is is where the heel spur is commonly seen when an x-ray (lateral view) is ordered. The heel spur is believed to form over the years when the plantar fascia pulls (traction) on the heel and a heel spur is more likely seen in people with plantar fasciitis. However, the spur is unlikely the cause of the pain, therefore intervention is rarely directed at the heel spur. This is not the topic of discussion today I will not elaborate about heel spurs further. What can increase your risk of a plantar fascia rupture? Both cases that were referred to me had the fascia torn shortly after corticosteroid injection(s). The direct cause of rupture was walking, not trauma, neither was there a high impact. Therefore, we can tell that steroid injection could lead to a weakening/failure of the plantar fascia integrity. Although steroid injection has a good short term (4 to 12 weeks) pain relief effect, retrospective studies observing a large group of patients who had undergone steroid injections for a longer period of time seem to show that there is a strong link between steroid injections and plantar fascia ruptures. Acevedo and Beskin first published a paper in 1998, which looked at 765 patients with a clinical diagnosis of plantar fasciitis. 51 of these were confirmed plantar fascia ruptures and 44 were associated with corticosteroid injection(s). It was reported that one of the authors (Beskin) was the doctor who performed 122 injections in this study and approximately 10% of them resulted in ruptures. Saxena & Fullem (2004) looked at 18 athletes who sustained a plantar fascia rupture and found that 4 of them had prior steroid injections. Kim and colleagues (2010) reported 4 out of 120 patients (2.4%) experienced plantar fascia rupture following an average of 2.67 injections. Lee and colleagues (2014) have found that in a cohort of 286 subjects with plantar fasciitis, 35 of these people have a plantar fascia rupture, and 33 of these 35 had steroid injections in the past. It is also interesting that other risks factors like age, gender, the affected site, visual analog scale pain score, previous treatment, BMI, degree of ankle dorsiflexion, the amount of activity, calcaneal pitch angle, the presence of a calcaneal spur, and heel alignment between the 2 groups all are not associated with plantar fascia ruptures. Here’s a link to the powerpoint presentation of this paper. However, a review done by Ang (2015) of 10 randomised controlled trials proves that this risk is low. After reading through this paper, it does have it’s own bias. Out of these 10 trials, the follow-up period after injection is relatively shorter: 6 months for most of the studies, maximum 12 months for 1 study. In addition, 3 studies did not report adverse effects! Furthermore, there was an error in his review of one of the papers, which I have since written in to clarify with him. Yes, even published scientific journals may contain errors if you read blindly! It seems like steroid injections for plantar fasciitis treatment greatly increases the risk for rupturing your plantar fascia! What happens if I got a plantar fascia rupture? It must be really painful! From my patients’ experiences, it hurts when it ruptured for a couple of days, just like the pain from the original plantar fasciitis. Subsequently, the pain gets better with time. Initially they had to use some assistive device like a walking stick to offload the painful foot but it gets better over time. Reports also show that patients return to full activity between 1 to 3 months. Athletes return to activities between 2 to 26 weeks (mean, 9.1 +/- 6.0 weeks) after injury, including runners and most of them had to use orthoses in their footwear. Most of them followed a protocol of 2-3 weeks of non-weightbearing, followed by 2-3 weeks of walking in a high-top boot and physiotherapy/orthosis use. Interesting to note that there were 2 athletes who did not keep to the 2-3 weeks of non-weightbearing instructions as they suffered what seems to be ‘milder’ forms of plantar fascia rupture; similarly, they got better too. *Bear in mind that the above relate to athletes. If you work with people who are sedentary and not physically fit, results may vary. Apply due care and reasoning when treating someone with a ruptured plantar fascia! What’s the big deal if I got a plantar fascia rupture? My plantar fasciitis pain is gone, right? Not everyone with the fascia ruptured experienced pain relief. Many of them carry on to suffer from the same or related foot problems. Approximately 50% of patients with symptomatic rupture will have long term or permanent sequelae related to this injury (Acevedo & Beskin, 1998). Seems like a ruptured plantar fascia can lead to major problems in the future. There are more technical stuff going on if specific bands of the plantar fascia are torn, please read the papers here and here. The same author also conducted another study, this time looking pain-free subjects who had prior plantar fasciotomies. 16 ankles from 15 subjects were investigated with MRI done on average 24 months (range 11-46 months) after surgery. Complete absence of signs of plantar fasciitis (plantar fascia and perifascial soft tissue swelling), although thickness of the plantar fascia is still observed. These 2 studies are retrospective studies based on small numbers and do not take into account all patients who had undergone plantar fasciotomy. Caution is still required when interpreting these results. What can we do for plantar fascia ruptures? Based on the study by Saxena on athletes with plantar fascia ruptures, we should adopt 2-3 weeks of non-weightbearing in a high-top boot, and 2-3 weeks of walking in a high-top boot. During this period of ‘relative inactivity’, physiotherapy is recommended to improve the physical function. Orthosis prescription seem to be important to return an athlete back to sports. What else can we do if we don’t want to end up with a ruptured plantar fascia? Yes, steroid injection is the current best treatment to relief pain from plantar fasciitis but it has it’s risks. Looking at the effectiveness of steroid injections, the result is short-lived. 2 randomised controlled trials (here and here) compared steriod injections to placebo (saline: salty water injected into your heel) demonstrates that it’s pain relief effect did not last more than 4 weeks. Both groups achieved significant improvements at the 3-, 6-, and 12-week follow-ups, the SI group exhibited better outcomes at all 3 time points. However, the improvements continued to last for only the E group for a period of time ranging from 12 weeks to 1 year. This research further proves that effectiveness of steroid injections do not last, while regular exercise sessions have a more positive long term effect. What can I conclude after reading this article? Considering all these, choosing physiotherapy for plantar fasciitis is safe, more likely to show long term results! What should we be considering when we treat plantar fasciitis? Next Post What should we do for Acute Low Back Pain?